Published in Rafu Shimpo, May 10, 1961. Outstanding senior awards at Berendo Junior High School in Los Angeles, California, May 9, 1961. 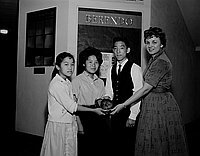 Includes winners of annual spelling bee with two girls, Helen Yee (A7) and Janice Murayama (A9) receiving a winners' plaque from student body president and Supervisor of upper and lower division matches, Mrs. Janice Taylor, a Caucasian woman; group of two students and five adults, most Caucasian, standing on steps of school. Typed on original negative envelope: Beredo Junior High.